HEMPSTEAD, NY—Highly emotional in the wake of last night’s town-hall-style debate, a tearful Mitt Romney called a press conference this morning to “come clean” about having a rare, little-understood disease known as Shuttlesworth Syndrome, a condition that prevents its victims from sitting quietly on stools anytime they are repeatedly told to do so. 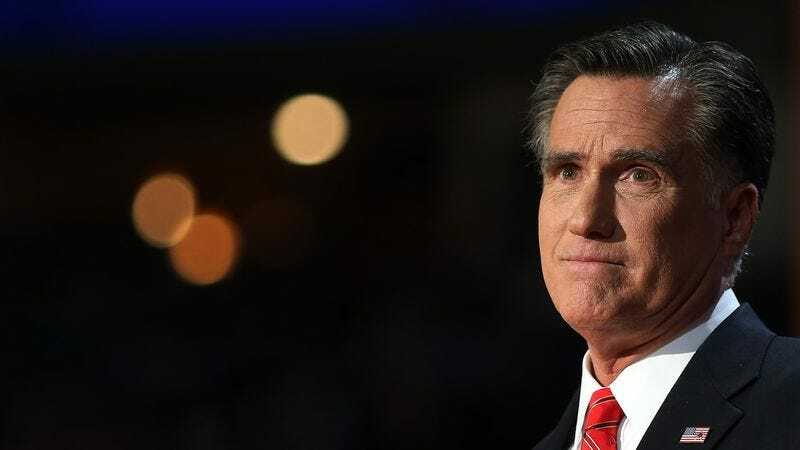 “As a sufferer of this rare disorder, being told to sit down and shut up—particularly when a stool is involved—only provokes in my central nervous system a violent overreaction that forces me to behave in the exact opposite manner,” Romney told reporters, his voice cracking with emotion as he revealed his secret to the world. “Without meaning to, I reflexively stand up, stride forward, and continue trying to speak—doing so even, and especially, when one or more people are instructing me to stop talking immediately and go back to my stool. It is a truly debilitating condition that I have battled all my life.” Romney said additional symptoms of the syndrome include an inability to maintain a convincing human smile, inexplicable reversals of previously stated policy positions, and an impaired ability to chuckle without sounding like a deranged maniac.